Drums Courtesy Frank Ippolito - Professional Percussion Center, N.Y.C. A Product of Flying Dutchman Productions, LTD.
A Division of RCA Corporation. From the inside sleeve: This is a set to savor for the brilliance and warmth of its performances – collective as well as individual. It is also most revealing of the essence of jazz. And third, "Hot Coles" illuminates the burgeoning jazz scene on the west coast – from the long-prestigious Shelly Manne to Oscar Brashear, a trumpet player who is sure to figure prominently in all kinds of polls in the years ahead. 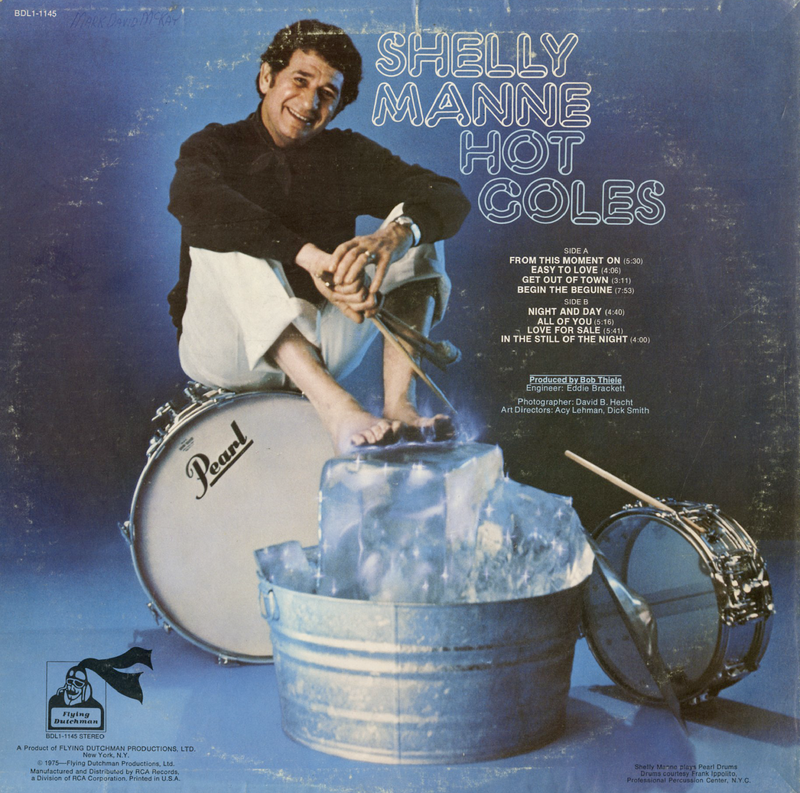 After I heard the test pressing, I was so taken with the freshness and inventiveness with which these vintage Cole Porter standards had been revitalized that the first question I asked Shelly Manne was who had done the arrangements. "No one," Shelly answered. "That is, no arranger as such. Everybody on the date contributed as we went along. And that's precisely what I had planned. I wanted to avoid everything's being perfectly arranged from the start. If you have scores which are the precisely set, you're going to lose spontaneity. What I prefer, and what we did here, is to start with just lead sheets. And then, as we work things out in the studio, we begin altering the changes, the time signatures, the tempos. And what you get, for one example, are tempos at which some of these songs have never been played before. With many musicians, this kind of on-the-spot creation can be risky. You have to be vastly experienced in improvisation to make it all sound flowingly cohesive as well as spontaneous. "But the men on this date," Shelly points out, "are jazzmen, and the greatest asset a jazzman has is that when the red light comes on, when the pressure is on, he always comes through with something the fits right." A case in point is Oscar Brashear who is the most assertively lyrical "new star" trumpeter I've heard in a long time. I first learned about him from Oliver Nelson, and then from other Los Angeles musicians. "That's how his reputation began," Shelly recalled. "Musicians started talking about Oscar, and now word is spreading all over. One thing Oscar has going for him is that he plays with such fire. He's a true "hot" player. Even when he's playing something pretty and soft, it comes out with a "hot" sound." Oscar Brashear is also a very quick study. "I've seen him try something for the first time," Shelly notes, "and he plays it. No hesitation, no clams. Also, his lines and ideas are continually original, and they fall into totally logical designs – always with that fat, warm sound." Complementing Brashear is Tom Scott on soprano saxophone, alto flute and regular flute. I've been impressed with Scott's work on a number of other occasions, but his playing on this session seems to me among his most consistently expressive and original on record so far. "Well," Shelly said in response to my observation, "Tom was exceptionally relaxed on the date because everyone else was too. What always strikes me about him, just as it did when he first came up at 18, is how mature he is for a young musician. But then in one aspect of that maturity, Tom is indicative of a lot of young musicians. These days they're into writing and composition as well as into playing their instrument, and they're also involved is so much music, a broad spectrum form rock to jazz. Therefore they acquire a greater amount of knowledge faster and they mature a lot earlier than used to be the case with older musicians to whom this range of experience was not available." Other musicians on the date whose work exemplifies that maturity are pianist Mike Wofford and bassist Chuch Domanico. Wofford, who was in Shelly Manne's band for some seven years, "never failed to astound me," Manne emphasizes. A favorite among musicians on the coast, Wofford, as you can hear, is persistently original and plays with strong, deep expressivity. Chuck Domanico is pretty much the bass player these days in the Los Angeles area. One of his rather singular attributes, as is evident in this session, is his ability to switch from acoustic to Fender bass without distorting the sound and feeling he gets from the instrument. Another find on this album is guitarist Tom Tedesco. I asked Shelly why, on this basis of his playing here, Tedesco is not more widely known as a jazz guitarist. "For a long time," Shelly explained, "Tom had done mostly studio work and wasn't considered a 'jazz' player around her. But I had heard him jamming between takes in the studios, and I knew what he could do. Well, I finally talked him into making this date, and I'm delighted." In this first pure jazz date Tedesco has done, what comes through with particular impact is his marvelous sound and his acute sensitivity to his surroundings. "No matter what the musical context," Shelly says, "he fits in perfectly." Tedesco, by the way, plays a spectrum guitar, including classical and 12-string. 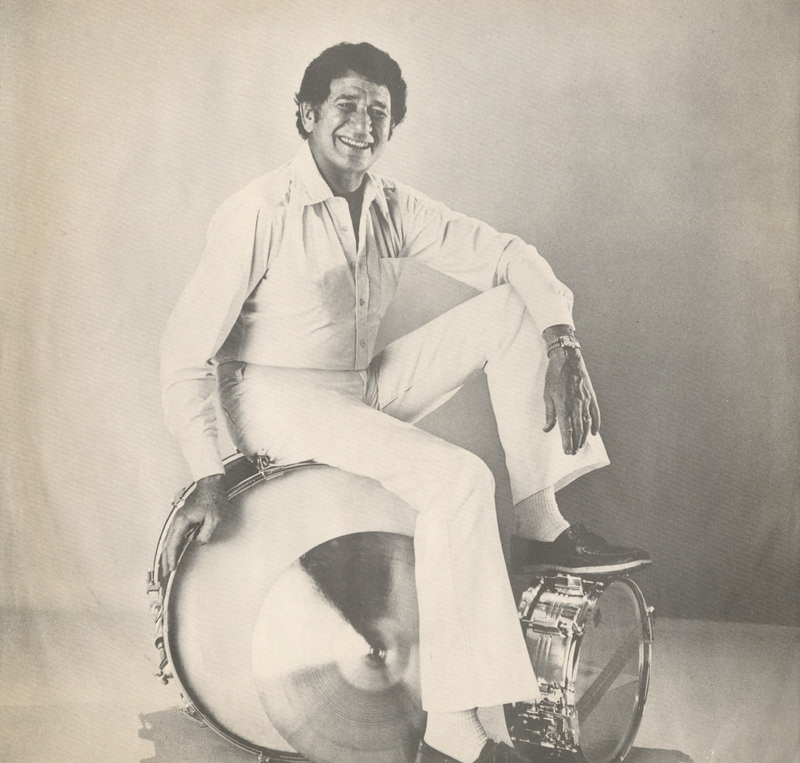 Another musician who invariably fits seamlessly into all kinds of musical surroundings is Vic Feldman, pianist and percussionist on this date. "Vic has such fantastic time conception," Shelly notes, "along with the extraordinary and imaginatively with Feldman are, on various tracks, Brazilian percussionists Mailto Correa and Moacir Santos. This set is a remarkable illustration of first-class collective improvisation – all the way through. 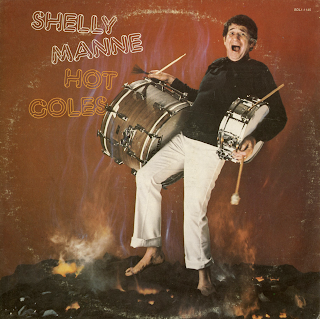 It sounds, I told Shelly Manne, as though he and the other musicians had been working as a unit for years.